however, believed to be fully functional, and has been posted in an attempt to get user feedback. 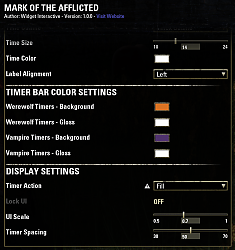 Mark of the Afflicted is a fairly simple addon for Elder Scrolls Online which tracks all of your vampire and werewolf characters and monitors their bite timers. 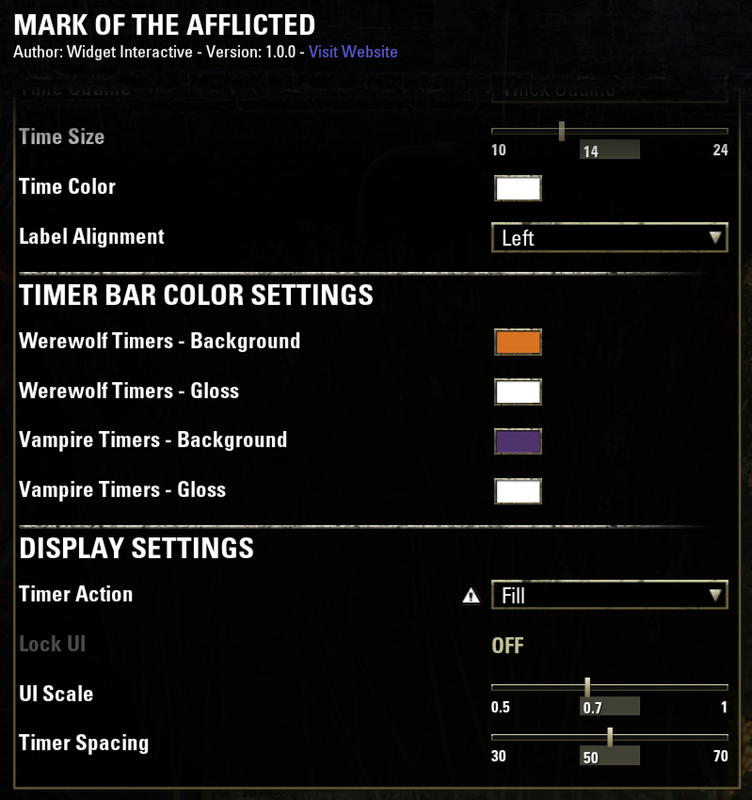 In addition, it will (eventually) provide a handy map system for locating vampire altars and werewolf shrines. Right now, Mark of the Afflicted doesn't do that terribly much, but I want to take it a lot farther. But, to do that, I need feedback! What can be improved with the existing setup? What would you like to see added? Let me know, and I'll see what I can do! Feel like supporting? Why not donate? Any thoughts/suggestions to resolve are appreciated! Thx! Anyone have any constructive insight or suggestions regarding the above error? Whoops! Sorry, somehow we never got a notification about this post. Looking into it now! Last edited by ZoLatKam : 06/12/18 at 05:31 PM. Fixed! (I think...) Let me know! 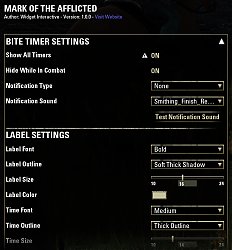 As for suggestions, what about an option to show timers while in addon settings menu? So we can see changes as they're made, instead of having to esc out and back again 5874354 times, if anyone else is like me and tests out every label font option available before settling on one, haha. PS: Feel free to drop us a note with any feature requests or suggestions for new addons! Just pushed an update... See if that fixes the bug for you! Interesting... I don't use Zolan's Junk Handler, but I'll install it and see if I can replicate the bug. 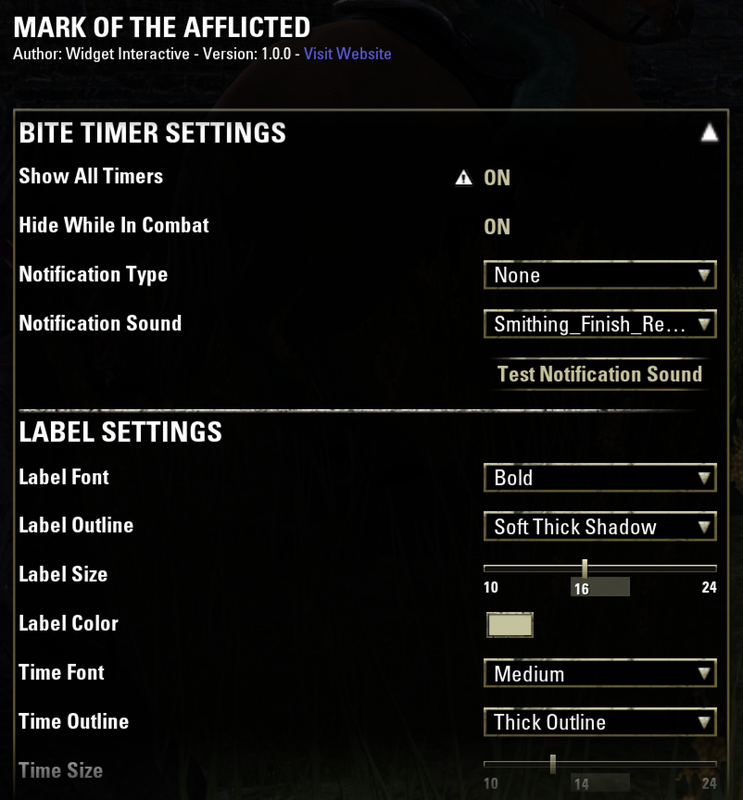 Requests: Could you add an option to show the timers while in settings menu? To make it easier to test out the label settings! And is center alignment possible for labels? Edit: Was changing settings and got some errors. D: Conflict with Zolan's Junk Handler? Last edited by Kenza : 05/29/17 at 03:48 PM.